Overview. Read our overview page to learn about the types of research we promote, who should apply, and expectations for NIMBioS researchers, including acknowledgment formats, how to report your publications and products, and instructions for organizers of NIMBioS Working Groups and Investigative Workshops. 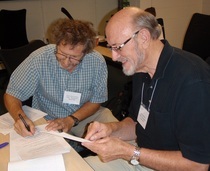 Innovator Workshops at NIMBioS aim to enhance understanding of important questions at the intersection of biology and mathematics and to generate new approaches for addressing them. Accelerator Tutorials at NIMBioS provide both students and professionals with in-depth, cross-disciplinary instruction in quantitative topics. Tutorials can be held on-site at NIMBioS or with virtual participants held live online at NIMBioS. Short-term Visitors are supported to work on-site at NIMBioS for periods up to one week to foster synthetic research at the interface between mathematics and biology. Self-supported Visitors. NIMBioS provides office space and a collaborative scientific environment for self-supported visitors for visits of up to several months duration, with the length of stay determined by the objectives of the proposed project. Working Groups focus on major well-defined scientific questions at the interface between biology and mathematics that require insights from diverse researchers. Investigative Workshops focus on a broader topic or a set of related topics, summarizing/synthesizing the state of the art and identifying future directions. Postdoctoral Fellows propose synthetic projects that require an amalgam of mathematical and biological approaches. Graduate Assistantships are open to current UTK/UTIA graduate students working at the interface between mathematics and biology. Application Deadlines. Proposals for Innovator Workshops and Accelerator Tutorials are considered three times each year with deadlines on April 1, July 1, and November 1.